A-level Accounting helps students to develop knowledge and understanding of the purposes of accounting and apply this to a variety of accounting problems. planning work, taking into account the demands of the task and the time available to complete it. This specification has no coursework or controlled assessment. 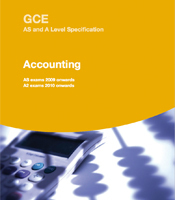 It is not necessary for students to have studied GCSE Accounting before commencing work on this specification and no prior knowledge of accounting is necessary.